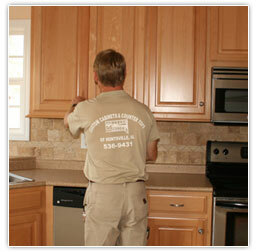 In 1987 Kevin the President of Custom Cabinets started building cabinets. In 1990 Kevin relocated to a new cabinet shop, where he started as cabinet shop manager. 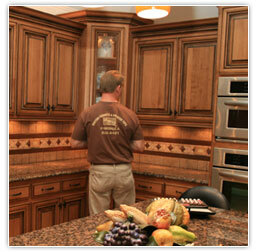 In 1997 Kevin and his wife Shannon bought the cabinet shop he had been managing. Kevin, Shannon and one other employee started out together. Within a few months they had to hire more employees to keep up with the work load. 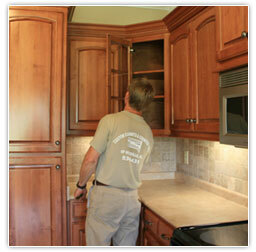 In 2002 they found the need to expand, Kevin moved to a new location to be able to build more cabinets. His wife stayed at their first location to run a custom cut countertop shop. In 2004 still expanding they found the need to incorporate. In the past 23 years Kevin has been able to do what he loves, designing and producing quality products. He has tried to show each customer special care, from the beginning to the end of their home project. Doing this over years Kevin has acquired a name of being dependable, on time and having great workman ship. Because of this Kevin and Shannon have found lasting relationships with many of their customers. Thanks to all our customers that have let Us serve them thru the years. We have Truly been blessed.